In his discussion about the golf swing in embryo, Percy manages to include a lot of valuable information in just a few sentences. According to Percy, the picture at the bottom of this entry is, perhaps the most important picture in his book for all golfers to study. Above the line all movement is passive, below the line it is active. Leg muscles have been used to push out the left knee and to pull back the right knee. No other muscle in the whole body has been used actively. 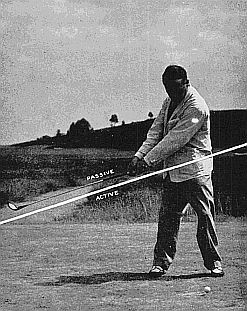 Relative to the club, the hips, shoulders, arms, and hands are in exactly the same position as at the address. Conversely, to bring everything back to the position of the address, all that needs to be done is to straighten the left leg and slightly to bend the right one. The reason for keeping the wrists up at the address is now obvious: Had they been broken (held down) at the address they would be cocked up as the club was carried back.